We’re excited to introduce to you the Ethfinex token sale platform — a crowdfunding platform designed to enable secure and effortless contributions to ERC20 token sales, directly from your Ethfinex wallet. The token sale platform will allow users to pledge funds directly to a selection of the highest quality token sales whilst also being able to view other user’s analysis, ratings and discussion about the projects, helping to filter out the noise. The platform is designed improve the user experience of token sales, allowing participants to skip crowdfunding queues through pre-pledging ETH ahead of time, at the click of a button. The contribution process takes place entirely on Ethfinex, takes mere seconds and works to effectively mitigate a number of risks associated with the protection of personal data, information phishing, token sale overcrowding, gas price errors and mistypings. Additionally, Ethfinex aims to enhance the transparency surrounding token sales in an attempt to improve protection of investors contributing to Ethereum based token sales. 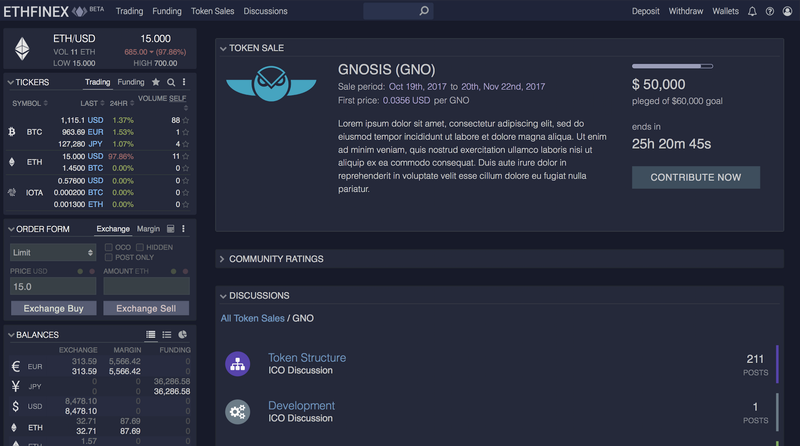 Crowdsales taking place on Ethfinex go through a strict evaluation process and must provide sufficient information with regards to the backgrounds of team members, technical/non-technical project summary and development roadmap, token sale T&C, user/data protection policy, legal summary and fundamental project legality prior to being considered. Once accepted for listing on Ethfinex, all projects will be screened and evaluated by the Ethfinex user community in the run up to the token sale. This results in a fully transparent project and token rating, largely determined through the wisdom of the crowds. Following a successfully completed sale, tokens will appear in your Ethfinex wallet, at a 1-to-1 ratio as soon as they are made transferrable. The tokens are subsequently tradable on Ethfinex or available for withdrawal to your Ethereum wallet. The percentage of tokens whitelisted for contribution through Ethfinex will vary on a case by case basis, and may be subject to personal contribution caps, dependent on crowdsale popularity, hard cap and the wishes of the team. We are in talks with a number of exciting projects and we will be releasing information on upcoming token sales shortly. We are working with a network of trusted partners with whom we share a vision of supporting the evolution of the Ethereum ecosystem. This includes the likes of Cofound.it, who brings with them the expertise required to thoroughly assess and advance high potential blockchain-based start ups.